Pancakes with Fruit and Nuts Taste the BEST! 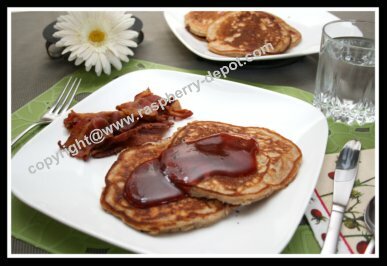 This Amazing Pancake Recipe with Raspberries and Pecans makes the BEST pancakes! Nuts and fruit added to pancake batter make healthier and much tastier pancakes than those without fruit and nuts ... your family will flip ;) over these homemade pancakes! In a bowl, whisk together the flour, pecans, sugar, baking powder and baking soda. In another bowl, whisk together the buttermilk, butter, eggs, and lemon zest (or juice). Gently stir the wet ingredients into the flour mixture, just until combined. Gently, so as not to break the raspberries up too much, stir in the fresh raspberries, just until combined. Spoon about 1/4 cup of pancake batter into a greased pan over medium heat. Cook until tops are speckled with bubbles and underside is golden brown. Note - If pancake batter appears too thin, add a little more flour as needed. Tip: Keep pancakes in a warm (200ͬ F) oven until all the pancakes are done. Serve warm with raspberry sauce or the topping of your choice!